PMI® (Project Management Institute) caters for the traditional project manager with the PMP methodology but also has a certificate for project managers working in Agile environments called the PMI-ACP®. The PMI-ACP® has been created in direct response to the rise in projects using Agile methodologies. The PMI-ACP® certification recognizes an individual’s expertise in using agile practices in their projects, while demonstrating their increased professional versatility through agile tools and techniques. The PMI-ACP® stands for Project Management Institute Agile Certified Practitioner Certification. It was specifically created for project managers who have experience working with Agile project methodologies. The PMI-ACP® is PMI ®fastest growing certification with little wonder as more and more companies start using Agile methodologies. The PMI® reported that 75% of projects were completed using Agile vs 56% using the traditional waterfall method. The PMI-ACP® covers Agile Methodologies such as Scrum, Kanban, Lean, Extreme Programming (XP) and test-driven development (TDD). The PMP® is more relevant to project managers who work with traditional methodology such as waterfall. The PMP® prepares you to plan, manage and execute a project on a high level. Qualified PMP® project managers have demonstrated their competency in understanding the process and techniques in the PMBOK®. While Agile methodology is mentioned in the PMBOK the majority of concepts are mentioned in regards to waterfall projects. The PMI-ACP® is then more focused on the Agile project management principles. Agile is more about getting quick feedback and work in iterations in comparison to making a plan and following from start to finish. The besides the fact they are catered for different project methodologies there is also one major difference. To apply for the PMP® certification you need to have experience as a project manager (though not exactly in a project manager capacity) and to apply for PMI-ACP® you need experience in general project experience and Agile project experience. There is NO prerequisite to do the PMP® before PMI-ACP® or vice a versa. 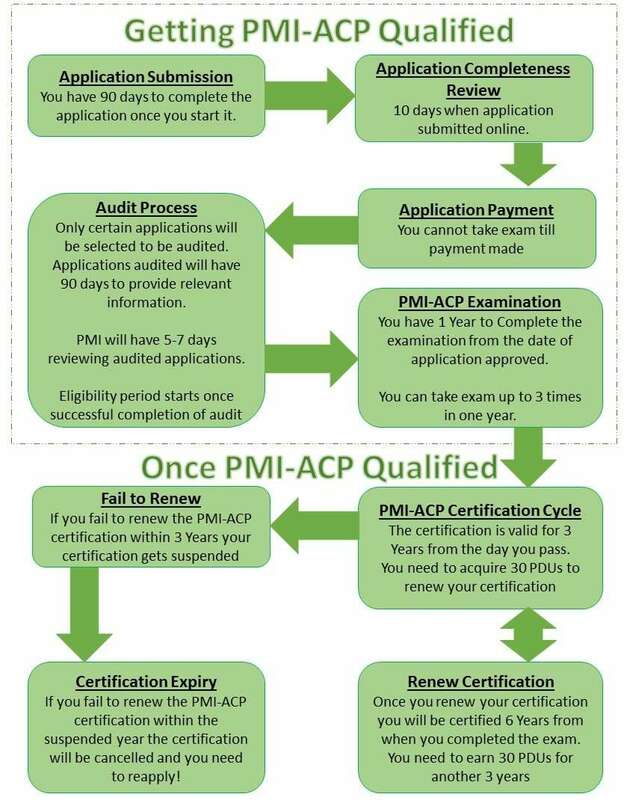 PMPs are required to accumulate a minimum of 60 PDUs for every 3 years to stay certified. Agile training for the PMI-ACP® can be put towards your 60 PDUs. When PMP and PMI-ACP® qualified you can claim the same PDU for both as long as the PDU is Agile related. The requirement of 2000 hours to do the PMI-ACP® is not required as you have already verified your project experience. After going through the PMP® process you are already familiar with the format and understand what it takes to pass a PMI® examination. 75% of projects were completed using Agile methodologies so more and more companies are using the methodology and would be advantageous in any interview to have. ** Working on Project Team Experience: for those holding a PMP® or PgMP® certification, PMI® has already verified that the candidate has exceeded the 2,000 hour requirement. A PMP® or PgMP® certification holder will not need to enter these hours on the application. If you have already decided you want to proceed with the pmp methodology you should check out the next section where we discuss how you can apply for the PMP.